Arrange spinach leaves on a large platter or individual salad plates. Top with mandarinorange sections and chopped red onion. Whisk together marmalade and vinegar. Stream EVOO into dressing while continuing to whisk. When you are ready to serve, pour the dressing over salad and season with salt and pepper. Enjoy! In Recipes-list.com we have selected the most viewed recipes from category - uncategorized . Enjoy the best recipes specially selected for you! 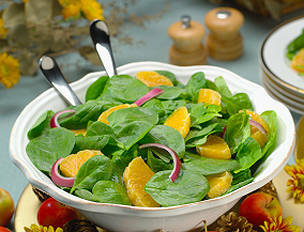 Baby Spinach Salad with Mandarin Orange and Red Onions is the right choice that will satisfy all your claims.